The unexpected plays an integral part in the magic of great cities, maybe that’s why we go out to have drinks in public bars in the end – to meet the unexpected, a stranger, a charismatic bartender, or just to witness a fight between guests, a love drama, you name it. 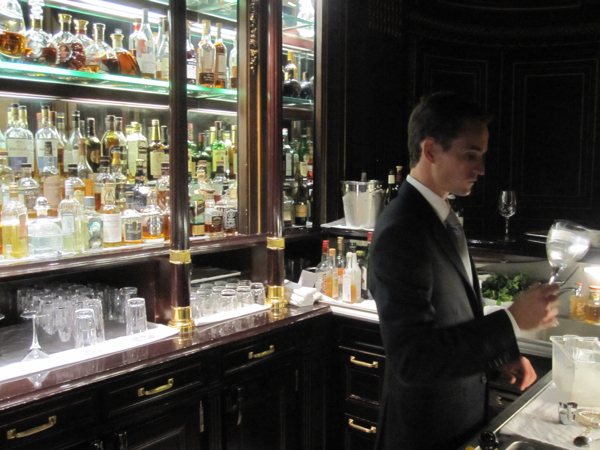 The bar of the Meurice hotel right opposite the Tuileries gardens is not a place where Charles Bukowski would have been inspired, it’s for the shiny happy people who can afford a room here or dinner at Alain Ducasse's great three-star-restaurant up front. Forget about the tagline on Meurice’s website that this bar was "the rendez-vous of Parisians“, it really isn’t, but it is still a very nice, cosy place, featured in Woody Allen’s hymn "Midnight in Paris“, and you wouldn’t be disappointed coming here for a last drink. There’s a live pianist, all the waiters wear proper garments and they serve a fantastic champagne cocktail named after star designer Phillipe Starck, a thing mixed with ginger, really good. If you had two or three of them, you could sit back afterwards and let yourself go, just looking up to the ceiling that is painted by Starck's daughter Ara with a fair sky in an early evening light, making plans for your next day in Paris. If you’re lucky, something unexpected will happen, like it happened to me two or three years ago. I was passing by the bar and just sneaking in from the lobby – and I saw actor Liam Neeson leaning against the bar, on his own, he was talking to the barman. But what impressed me most was that he wore a snow white suit, an impression that made me go to bed very satisfied with urban life.